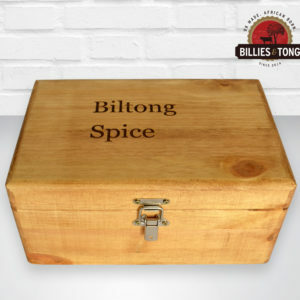 Biltong Spice Gift Box which can be personalised with a name/date or nickname. 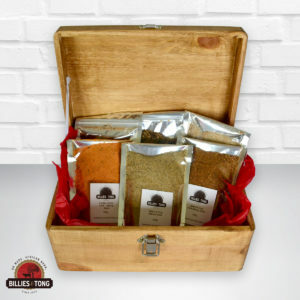 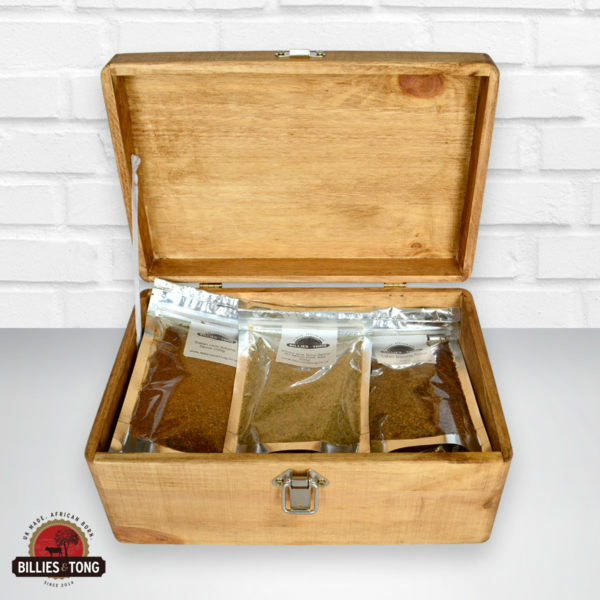 Our solid pine gift box includes 6 x 200g packets of delicious spices. Perfect for any Biltong maker or foodie. We guarantee a taste bud explosion with these perfectly blended spices. 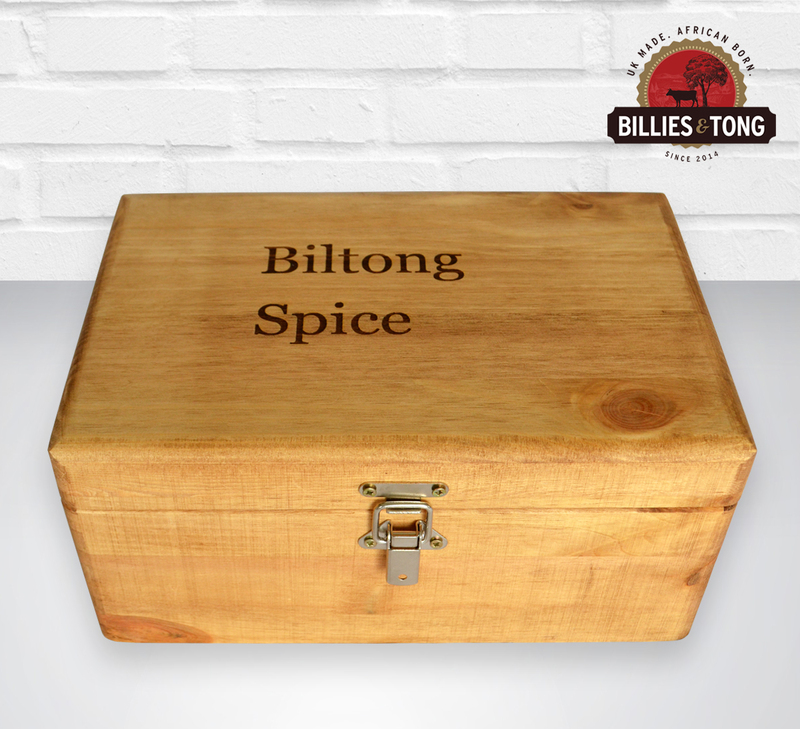 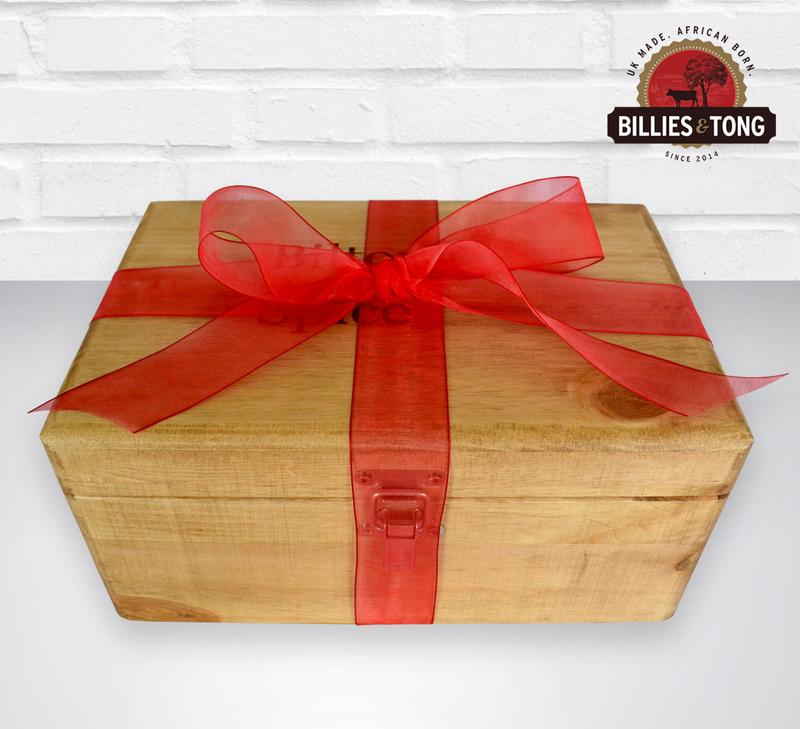 Each box has ‘Biltong Spice’ engraved on the lid and the pine has been given our classic Oak Effect. 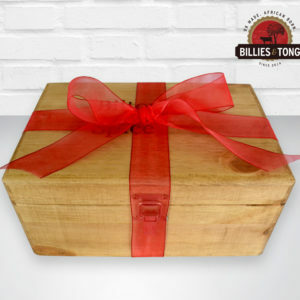 If you would like to have the box personalised, select yes from the drop down and add a note when paying of what you would like engraved. Ingredients: FH Chilli Ingredients: Salt, Cereal (Maize), Mustard, Dextrose, MSG Flavour Enhancer (E621), Cumin, Chilli, Acidity Regulator (E330), Spice Extracts (Including Celery), Parsley, Flavour Enhancer (E635), Flavouring Irradiated IngredientsAllergens: Wheat Gluten, Soya Bean, Milk & Eggs. 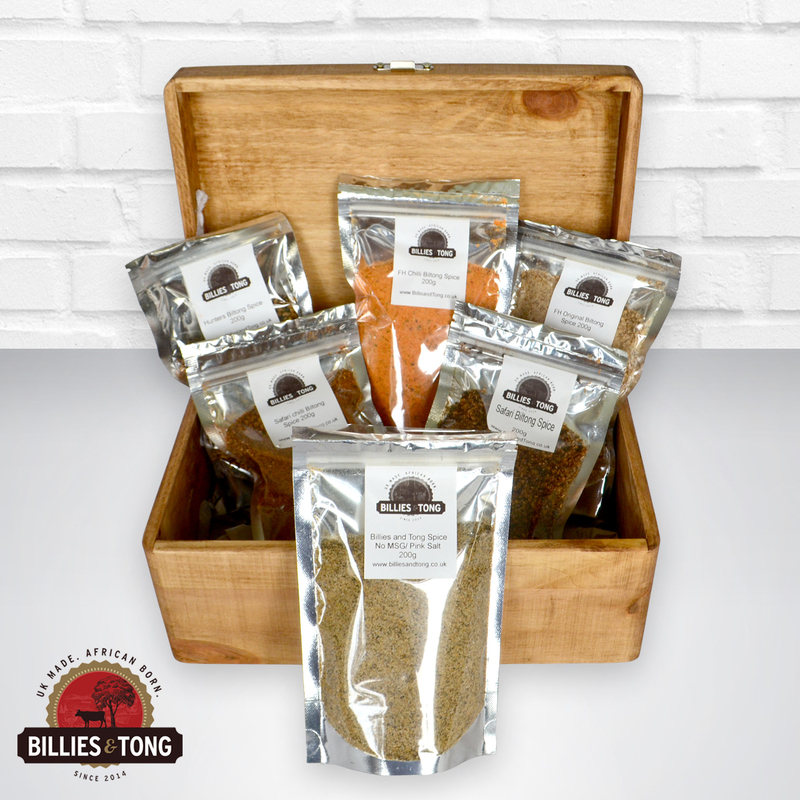 Ingredients: FH Original Salt, Coriander, White Pepper, Dextrose, Sucrose, Ascorbic Acid, MSG Flavouring Enhancer, Cereal, Wheat Flour, Gluten-Triticum Eadtivum, Flavourings Irradiated Ingredients.Allergens: Wheat Gluten, Soya Bean, Milk, Eggs. 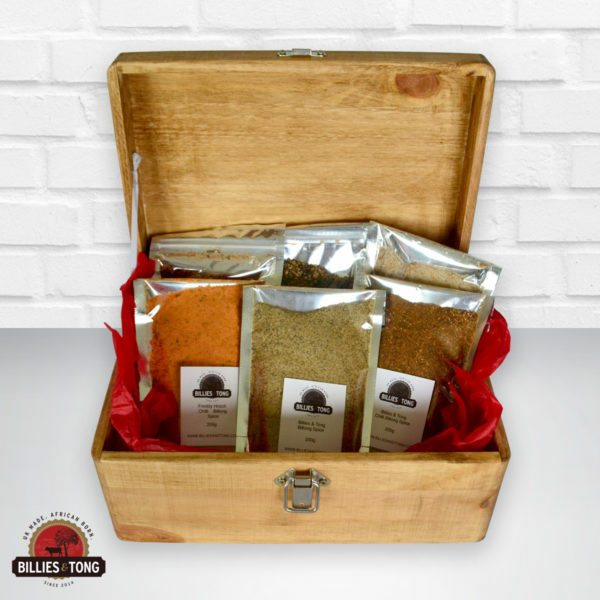 Ingredients: Hunters Spice Flavouring, Coriander, Salt, Sucrose, Pepper Black, Contains Genetically Modified Organisms, Irradiated Ingredients.Allergens: May Contain Wheat, Gluten, Soya Bean, Milk, Eggs. Ingredients: Billies& Tong Pink Salt Spice Pink Salt, Black Pepper, Coriander, Bicarbonate Of Soda Brown Sugar.